Chuck Lasker helps businesses and nonprofits with their online marketing while living on the island paradise of Kauai, Hawaii. Chuck Lasker has been been married to his wife, Sharon, since 1982. They have two adult sons, Brad and David. Brad is a chef, and David is a programmer. Their third “child” is their Shih Tzu, Petey. Chuck grew up on Long Island, New York, and lived in Indiana from 1985 to 2010. In 2010, after several years of visiting Kauai and wanting to make it their home, Sharon and Chuck moved here, first in Princeville, now in Kalaheo. Sharon is the Director of Marketing at the Regency at Puakea. Chuck spent six years as an electrical engineer, working for Texas Instruments, the Naval Avionics Center (with a Secret Clearance) and Delco Electronics. Realizing his passion was more in marketing and business, he jumped into marketing. For 9 years he was Vice President of Operations and Marketing for a national health products company. In early 2003, Chuck left the corporate world and became a full time independent marketing consultant, focusing on helping businesses and nonprofits with their online marketing. Chuck is a writer, trainer, public speaker, social media addict, consultant, and the official video tutorial creator for several companies. Chuck has spoken nationally on ecommerce, affiliate marketing and social media. As a writer, Chuck has been published in Practical eCommerce Magazine, Website Magazine, The Huffington Post, Kauai Family Magazine, The Garden Island Newspaper and more. For two years Chuck helped found Kauai nonprofit, Keiki to Career Kauai. Chuck is on the Board of Directors of the Kauai Independent Food Bank, a member of the Kauai Chamber of Commerce and Kauai Filipino Chamber of Commerce, and serves on the PR Committee of the Kauai United Way. 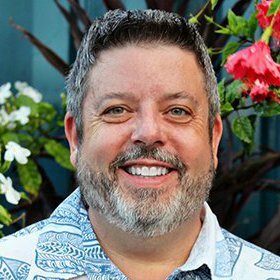 Chuck has volunteered with the Kauai Planning and Action Alliance, Mālama Hulē‘ia, Kauai Community Players and others, as well as provided free social media training for dozens of local nonprofits. Online marketing consultancy with an emphasis on social media. Includes: •	Ongoing online and offline marketing management for multiple clients. •	Website and social media presence design. •	Training classes on social media marketing for businesses and non-profits. •	Search engine optimization and pay per click ad management. •	Content development including video marketing. Self-employed with various profit centers. Details and accomplishments: •	DoublePlus New Media Marketing: Consulted with hundreds of ecommerce clients. Website design, development, SEO, usability, conversions, analytics, maintenance, and affiliate marketing. Sold in Oct. 2007. •	Founded and sold Practical eCommerce Magazine, an ecommerce industry publication. •	MerchantTutorials.com: Provided training in Miva Merchant e-commerce software through video tutorials plus one-on-one and group screen-share webinars. Speaker at user conferences in San Diego, Dallas, Orlando, Virginia, and Indianapolis, as well as Affiliate Summit and Blog Indiana. Sold to Miva Merchant in 2010. •	Freelance writer including Huffington Post and Website Magazine. •	TutorialsUnlimited.com: Custom voice-narrated screen-capture training tutorial videos for software and websites. Vice President of Marketing and Operations at Developmental Natural Resources, Inc. Joined health products startup to develop base marketing methods. Included creation of dealer structure, marketing and training materials. Developed dealer commission and communications tracking database. Created all marketing concepts and materials as company grew from 12 to 240 products. Built ecommerce website including wholesale dealer portal. •	Increased monthly sales volume by 1400% in first seven months. •	Grew dealer base from 6 to over 5,000 dealers worldwide. •	Sales doubled in last year of employment to over $2 million per year after implementing new product and sales strategies. Founder of diversified business including a pre-Internet automated telephone church referral service and Christian business phone book. Developed concepts, sales approaches, marketing materials, training materials, training manuals & business operations format. Hired, trained and managed sales people and developed joint venture relationships. Territory Manager for school and sports photography company. Responsible for prospecting, selling and servicing accounts in eastern Indiana as well as training new sales personnel. Sales Representative for direct mail advertising program. Responsible for development of two territories including cold calling, selling and servicing of new accounts. Achieved highest sales volume for Indianapolis for every selling period. In charge of several projects involving anti-lock brakes and traction control systems for General Motors cars and vans. Responsible for communication between customer, sales, design, manufacturing, testing and management. Design Engineer in Applied Research and Test Equipment departments. Responsibilities included computer hardware and software development of several military projects. Performed hands-on digital board design, experimental projects including laser data calculations, product testing and debugging, specification compliance testing and reporting, technical writing of end-user instructions and digital design on Daisy CAD system. Responsible for production of memory devices including supervision of technicians, presentations of product status, and process development. Achieved record 97% yield for 16K DRAM production utilizing new production methods on this historically sub-92% yield product. Nonprofit volunteering, social media, writing, the beach, my Shih Tzu Petey, reading.